Ryder System, Inc. (NYSE:R), a leader in commercial fleet management, dedicated transportation, and supply chain solutions, announced today that W.B. Mason, the nation's second largest privately owned office products dealer, has taken delivery of Workhorse E-GEN electric, range-extended step vans. The company has expanded its fleet with the Workhorse electric vehicles to support its national business product delivery operations. "Ryder is proud to be working with W.B. Mason to bring long-term environmental and cost saving benefits of electric vehicles to its business and we look forward to expanding the partnership in the years to come," said Dennis Cooke, President, Global Fleet Management Solutions for Ryder. "We are committed to leveraging our experience and expertise to help further the adoption of this innovative fleet solution. When companies outsource to Ryder, they get the value of our extensive experience operating and maintaining advanced vehicle technology fleets, so they can reduce risk, increase uptime, and speed return on investment." In 2017, W.B. Mason announced its plans to lease Workhorse E-GEN electric vehicles through Ryder as the Company is the primary distributor and provider of service and support for Workhorse's light and medium duty range-extended electric vehicle fleet in North America. W.B. Mason is taking delivery of four electric vehicles from Ryder this year. The company's fleet expansion is a continuation of W.B. Mason's commitment to personalized, pin point delivery which aims to enhance its longstanding customer intimate delivery model by providing cost effective and environmentally sound delivery services. 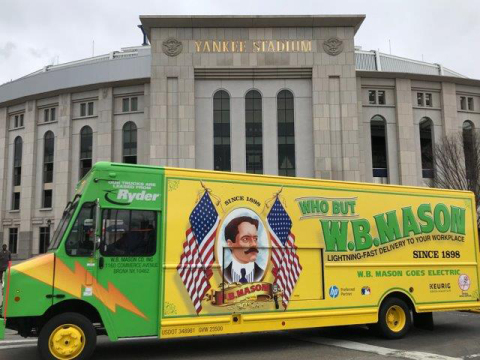 "Making the switch to electric vehicles with Ryder was easy as we've trusted them to support our delivery operations with lease vehicles and maintenance services for over 35 years," said Leo J. Meehan III, president and CEO of W.B. Mason. "Ryder's ChoiceLease Full Service solution, which includes extensive experience in maintenance for advanced vehicle technologies, allows us to mitigate concerns around transitioning to electric vehicles and positions us to promote efficiency and an even better delivery experience for our drivers and customers." Ryder collaborated with Workhorse to develop the electric vehicle chassis and Morgan Olson, the company that builds the walk-in van bodies for W.B. Mason, to configure a customized truck specification that meets the unique delivery requirements of a W.B. Mason vehicle. The vehicles will be supported by ChargePoint, the world's leading electric vehicle charging network, as the primary charging infrastructure provider. Workhorse's E-GEN step van demonstrates a 40 MPGe fuel efficiency in on-the-road applications, which reduces vehicle emissions by 75 percent and is six times more efficient than conventional step vans. The E-GEN model provides an average range of 120 miles on a single charge, with 60 miles all-electric utilizing Panasonic Li-Ion battery packs, and an additional 60 miles using the integrated BMW range extender. Ryder is a FORTUNE 500® commercial fleet management, dedicated transportation, and supply chain solutions company. Ryder's stock (NYSE:R) is a component of the Dow Jones Transportation Average and the S&P MidCap 400® index. Ryder has been named among FORTUNE's World's Most Admired Companies, and has been recognized for its industry-leading practices in third-party logistics, environmentally-friendly fleet and supply chain solutions, and world-class safety and security programs. Inbound Logistics magazine has included Ryder in its "Green Partners" listing for nine years in a row. Ryder was also recognized by the U.S. Environmental Protection Agency (EPA) with a 2014 SmartWay Affiliate Challenge award and SmartWay Excellence Awards in 2014 and 2013. Ryder is a charter member of the NGV Fleet Forum and a member of the Department of Energy's National Clean Fleets partnership. Ryder is also a recipient of the 2011 NGV Achievement Award. A member of the American Red Cross Disaster Responder Program, Ryder is proud to support national and local disaster preparedness and response efforts. For more information, visit www.ryder.com, and follow us on our Online Newsroom and social media pages: Facebook, LinkedIn, Twitter, and YouTube. Morgan Olson is North America's leading manufacturer of Walk-In vans. Morgan Olson's "Route Star" walk-in vans & dry freight work truck bodies are seen every day serving a wide range of industries from Package Delivery to Newspaper, Beverage, Textile Rentals/Uniforms and baking and snack food delivery trucks. Morgan Olson work truck bodies have a proven legacy of providing the most efficient and safest delivery truck body on the market.